The pilgrimage to Kočevje included three destinations that are closely connected to the main event, a memorial service at the Kočevje pits for the commemoration of the 70thanniversary of themassacre which took place there. 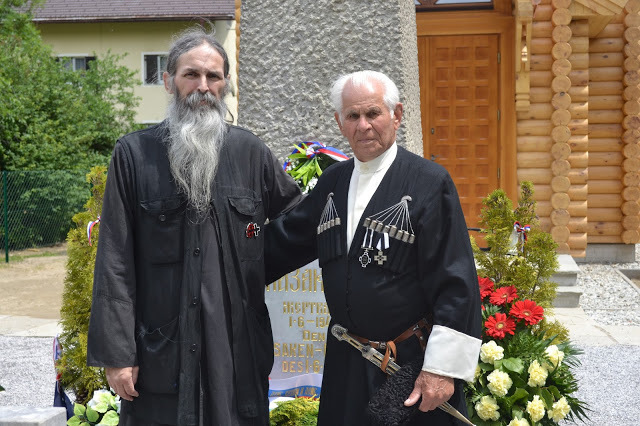 As the tragic events at the end of the Second World War connected to the Russian and Serbian peoples overlap in several places, the organizers of the pilgrimage decided to connect two great tragedies – for the Serbs, Kočevje, for the Russians, Lienz – on this memorial pilgrimage. Two Memorial Crosses: “Remember Kočevje” and “Lienz” which were worn by the Serbian pilgrims. The itinerary was set as following: Lienz, Nova Goritsa (the resting place of Serbian patriot Dimitry Ljotić), Kočevje. The group of pilgrims from Serbia, led by His Grace Bishop Akakije, started from Belgrade in the evening of May 31st, in order to participate, on the 1st of June, in the 70th anniversary commemoration of the Cossack tragedy in Lienz, Austria. The official event of the commemoration of the Cossack tragedy at Lienz was organized by the anti-Bolshevik Cossack organization led by the well-known Cossack activist Vladimir Melechov, whom, unfortunately, the government of the Russian Federation forcefully prevented from making the trip to Lienz (the police in the Moscow Demodedovo airport, behaving like brigands, ripped papers out of his passport and thus prevented him from leaving the country). The city government of Lienz also traditionally commemorates the tragedy of 70,000 anti-communist Cossacks who, in June of 1945, were disarmed, and along with the elderly, women and children, were given over by the English to certain death at the hands of the bloodthirsty executioners of Stalin’s Red Army.